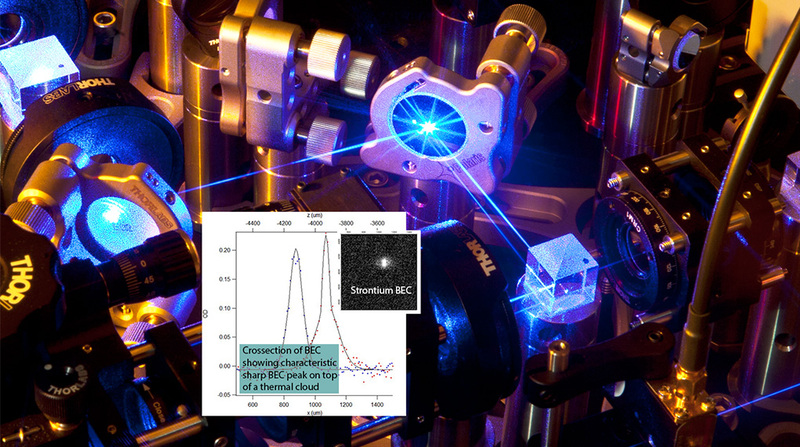 Gretchen Campbell’s UMD laboratory has reached an important milestone in their experiment: a strontium Bose-Einstein condensate (BEC). This brings the total number of ultracold quantum gases at JQI to 10. These experiments study a rich variety of topics, from quantum information to many-body physics. Campbell's lab is the third in the world to condense strontium into a quantum state. Satyendra Bose and Albert Einstein predicted BECs about 85 years ago. Ultracold quantum gases, gases in their lowest possible energy state, can now be made of either fermionic or bosonic particles cooled to extremely low temperatures, roughly around 10-100 nK. Bosons trapped in a harmonic potential can ‘condense’ or occupy the same lowest energy ground state. Fermions, on the other hand, are not permitted to take on the same quantum state. Instead fermions do the next best thing by filling into the lowest set of energy levels, forming a state called a degenerate Fermi gas. In 1995 BEC was achieved in dilute gases. Physicists Eric Cornell, Carl Wieman, and Wolfgang Ketterle were later awarded the 2001 Nobel prize in physics for first creating these “atoms in unison,” which have been central to the explosion of experimental research in atomic systems. Degenerate Fermi gases were first achieved in 1999. During the past 15-20 years scientists have dramatically improved upon the original experimental methods, increasing the number of atoms in these condensates from 1000 up to 107, with condensate lifetimes lasting minutes. Although considered part of the standard experimental toolbox for atomic physics, constructing BEC and degenerate Fermi gas experiments remains challenging. A clear recipe for making this ultracold quantum gas exists, yet the apparatus design remains highly dependent on the specific research objectives. An orchestra of finely tuned devices must all perform harmoniously to produce this synchronized state of matter. The players in this orchestration often include atomic beams, sophisticated electronics for stabilizing the laser frequencies, and vacuum systems having a pressure at around 10-14 atmospheres. This is at least a factor of 10 better than the vacuum in the region where satellites orbit the earth. For young graduate students, postdoctoral researchers, and even advanced scientists, the initial observation of a quantum gas still exciting. In fact, it is the process of designing and building that students often learn much of the atomic physics foundation they will need to succeed. And although the road to new discoveries in this field is fraught with challenges, making a reliable quantum gas machine allows researchers to begin to study new physics. While BEC occurs in superfluid helium, the widespread research in this field uses dilute ultracold gases because scientists can control this peculiar quantum system with amazing precision. Pristine, roughly identical BECs/Fermi Gases can be produced repeatedly in under a minute, making them an ideal and robust platform for experimentation. A gas of ultracold atoms is more dilute than air, but these quantum systems can behave like crystals, giving physicists a novel way to simulate and understand materials. Atomic physicists have a somewhat unique set of knobs at their fingertips---for example, the ability to vary the strength of the atom-atom interactions. (In a condensed matter system, this would be like varying the electron-electron interactions, a parameter that is not controllable.) Even fluorescence from single atoms trapped in an optical lattice of light potentially can be resolved, reminiscent of the single atom control available in ion-trapping experiments. For research reasons, physicists choose different atomic species when building a quantum gas. Often times, they pick alkali metals because of the characteristic internal structure (which resembles hydrogen) and the corresponding availability of lasers necessary to cool the atoms. At JQI there are two sodium BECs, five rubidium BECs, one potassium Fermi gas, one ytterbium BEC, and now the recently added strontium BEC in Campbell’s lab. While JQI labs are currently spread between the NIST and UMD campuses, most of these experiments are slated to move to the newly opened Physical Sciences Complex on UMD's campus.